Heritage Healers beautiful Aromatherapy Oil Blends are presented in four blends with nature’s elements of Earth, Water, Fire and Air. We use only the finest quality pure essential oils in a base of refined macadamia oil. Energised with healing crystals, each blend helps you draw on the strength of its elemental persona. Everyone can collect all 4 elements of aromatherapy oil blends. You can use a different blend daily, depending on your bio-rhythms, mood and schedule. By working with different oil blends, the body senses are continually stimulated and harmonised by the especially selected essential oils and crystals. Added to a bath, used in a massage or blended with our body moisturiser, these crystal energised blends provide an aromatherapy treat to support and strengthen you through the toughest day. After a shower or bath rebalance your energy and skin with a personalised aromatic body lotion. Simply combine your chosen aromatherapy oil blend with our high performance body moisturiser, the Chakra Body Essence, in your hand and apply for an all-over body rejuvenating treat. The refined Macadamia base oil, rich in Vitamins A, D and E, is wonderfully nourishing to the skin, while the Chakra Body Essence assists in the absorption of the aromatherapy oil blend into the skin for maximum skin soothing and toning benefits. Most importantly the beautiful natural aroma of the world’s finest essential oils will support you through the whole day! The best way to use the Pure Essential Oil Blends (10ml) is to add a few drops to your aromatherapy vaporiser, or in your bath. The Pure Essential Oil Blends, (just a drop or two) can also be combined with our body moisturiser, the Chakra Body Essence. When selecting Aromatherapy oils always opt for those whose qualities are most relevant to how you are feeling. 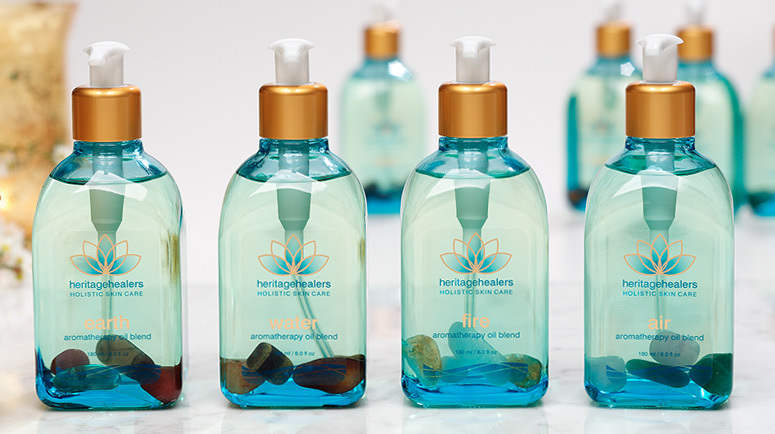 With Heritage Healers unique range of holistic healing therapies, selecting the appropriate Aromatherapy and Pure Essential oils is easy, simply follow the links to discover your persona.